The semifinals of a competition to find melodious voices among budding singers was held here today under the presidentship of Mr Ravinandan Sharma. 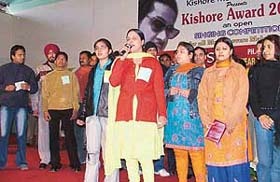 The competition was organised by the Kishore Memorial Society. “The competition is an effort to provide a proper platform to budding artistes,” said Mr Sharma. More than 150 participants from Ludhiana, Chandigarh, Amritsar, Panchkula and Jalandhar among other places showcased their talent. The finals will be held at the Nehru Sidhant Kendra on January 22. This entry was posted on Thursday, January 12th, 2006 at 4:39 pm	and is filed under Web. You can follow any responses to this entry through the RSS 2.0 feed. Responses are currently closed, but you can trackback from your own site. Kishore Kumar is the greatest singer & performer in the world. Kishoreda will remain in hearts of millions forever.A singer of his calibre was not born,& will not be born ever.It is not astonishing that he still has so many fans & followers. Kishoreda is every singer’s inspiration. Today is 13th october, his 19th death anniversary. Kishoreda was a very great singer. His varriation of voice is really excellent. . He will always remain in our hearts. His magic of voice will never end. His was not only a singer, but also a actor, producer, director, music director, lyricst. He was multitalented person. Kishoreda is every singer’s inspiration. ilove kishore da.